February 6, 2015 – NASA’s New Horizons spacecraft returned its first new images of Pluto on Wednesday, as the probe closes in on the dwarf planet. Although still just a dot along with its largest moon, Charon, the images came on the 109th birthday of Clyde Tombaugh, who discovered the distant icy world in 1930. New Horizons was more than 126 million miles (nearly 203 million kilometers) away from Pluto when it began taking images. 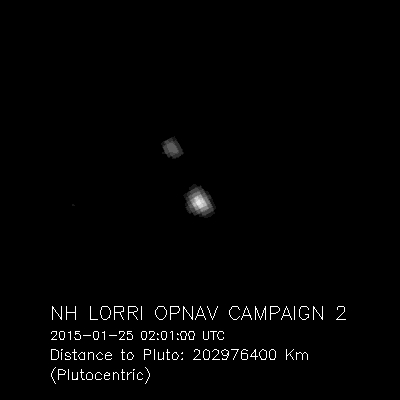 The new images, taken with New Horizons’ telescopic Long-Range Reconnaissance Imager (LORRI) on January 25 and January 27, are the first acquired during the spacecraft’s 2015 approach to the Pluto system, which culminates with a close flyby of Pluto and its moons on July 14. Over the next few months, LORRI will take hundreds of pictures of Pluto, against a starry backdrop, to refine the team’s estimates of New Horizons’ distance to Pluto. As in these first images, the Pluto system will resemble little more than bright dots in the camera’s view until late spring. However, mission navigators can still use such images to design course-correcting engine maneuvers to direct the spacecraft for a more precise approach. The first such maneuver based on these optical navigation images, or OpNavs, is scheduled for March 10. Closing in on Pluto at about 31,000 mph, New Horizons already has covered more than 3 billion miles since it launched on a United Launch Alliance Atlas V on January 19, 2006. Its journey has taken it past each planet’s orbit, from Mars to Neptune, in record time, and it is now in the first stage of an encounter with Pluto that includes long-distance imaging as well as dust, energetic particle and solar wind measurements to characterize the space environment near Pluto. APL manages the New Horizons mission for NASA’s Science Mission Directorate in Washington. Alan Stern, of SwRI, is the principal investigator and leads the mission. SwRI leads the science team, payload operations and encounter science planning. New Horizons is part of the New Frontiers Program, managed by NASA’s Marshall Space Flight Center in Huntsville, Alabama. APL designed, built and operates the spacecraft. The Laboratory for Atmospheric and Space Physics at CU-Boulder contributed the Student Dust Counter, the first student built instrument to ever fly on a NASA planetary mission.